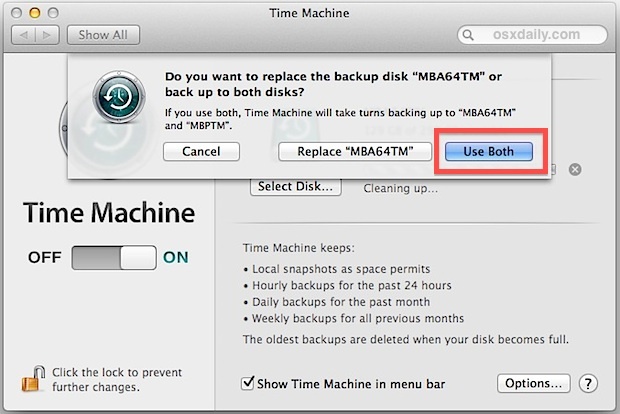 Having reliable and regular backups of your Mac should be considered a mandatory part of maintenance, and for most users Time Machine provides that with easy and peace of mind. But what if you want multiple backups stored in different places, like a backup at home, and another at the office, or perhaps a backup at home and a portable backup drive for the road? Or what if you just want to have a backup of your backup drive for data redundancy? 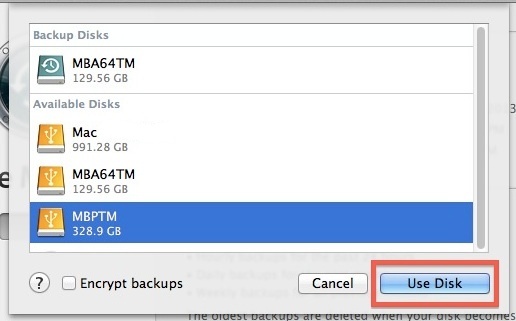 Time Machine can address any of these situations by allowing you to set a secondary backup drive, which provides an additional duplicate backup to another hard drive. Setting this is up is quite simple. The secondary drive will now be set as an additional Time Machine backup. Because the secondary backup is starting from scratch, it can take a while to complete the first backup to it, so you will probably want to leave it connected for a while as Time Machine does its job. All future backups will be completed sequentially in turns, finishing on the first drive before moving on to backup to the secondary drive. That means your backups will take twice as long if both drives are connected at the same time, though that generally has little impact on system performance for most tasks unless you’re really aiming to optimize performance on a Mac for resource intensive uses where speed matters. If both drives are not connected simultaneously (which may be the case for having backups in multiple locations, i.e. the office and home), then Time Machine will backup to either drive that is available whenever it is connected to the Mac. That either-or-both methodology applies to both the automated backups and also to manually initiated backups. 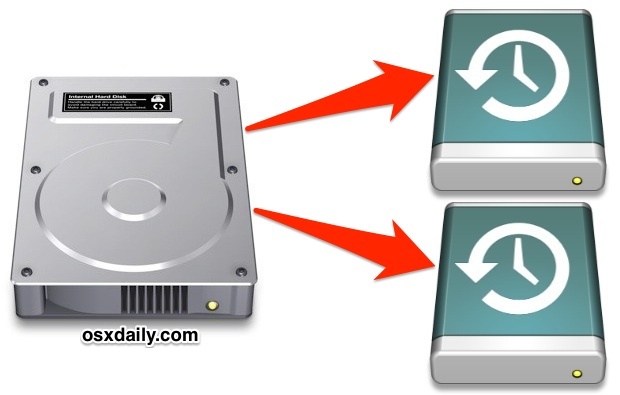 If you do have both drives connected to the Mac at the same time and you wish to browse the secondary drive through Time Machine, just hold down the OPTION key and click the Time Machine menu bar item, choosing “Browse Other Backup Disks”. All in all, this provides an excellent solution for data redundancy, and for users who want extra reassurance that their backups will be there for them regardless of the health of a hard drive or their location, using two Time Machine drives is often the simplest solution. Running OS X Mavericks 10.9.5. Had trouble with 3 backup disks (wanted to alternate for off-site storage). Time Machine seemed to recognize only two — it kept changing the name of second backup depending upon which disk was connected. Has this issue been solved post Mavericks? Have no confidence in Time Machine backups as a result. This is NOT correct information. OSX 10.7.5 Lion has time machine back up and does not allow for another drive to be assigned as an additional or secondary back up. Back up disk and Available disks are not shown separately in the TM pref window. They are all lumped together in 1 list and only 1 can be selected at a time with the Use Backup Disk button. The only way to use multiple back up disks in Lion 10.7.5 that I have found, is to manually select the disk and to back it up at that time. Once its done, another disk must be selected and the task repeated. This is how you make redundant backups on a Mac with any modern version of Mac OS, from OS X El Capitan, Mavericks, Yosemite, and newer. Using OS X Lion and Snow Leopard on a Mac is older software, so it wouldn’t be surprising if the feature was located in a slightly different location, but redundandcy has long been supported by Time Machine for backups. Find a way to backup the Mac to iCloud please.